Enter Android Jungle Through PC !! 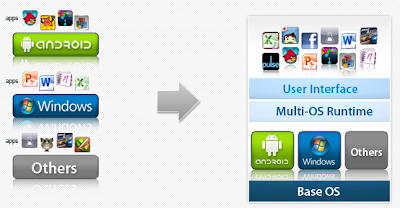 BlueStacks helps PC manufacturers to ride the Android momentum by enabling Android Apps to be run on x86 based ultrabooks, tablets, netbooks, notebooks, hybrid and all-in-one devices with a Windows operating system.It completely eliminates the need for end consumers to carry two devices. With BlueStacks on the new hybrid and convertible tablet form factors, the end consumer benefits from getting both Android and Windows at the price of a single PC. 1. Simultaneous Apps: Launch Windows and Android applications at the same time. 2. Shared Data: Share data, pictures and videos between Windows and Android. 3. Auto Updates: Upgrade Android to the latest version with automatic over-the-air updates. 4. Docked Profiles: Run Android on the docked PC at work and Windows on the external display, or vice versa. 5. Peripherals: Download apps from the Amazon App Store and other app markets. For Downloading this great app player please click on the below download links depending upon the configuration of your PC ! !